Clients of The Rapid Eye Movement, an award-winning Canadian visualization studio, have a common goal—they need to effectively market their large real estate development projects before they are built. For a pre-sale campaign to be successful, the hard work of selling tens or even hundreds of units must be finished prior to the end of construction. To a developer, this qualifies as a huge win. Many clients are looking for a traditional video “walkthrough” animation, which can be difficult, expensive, and time consuming. 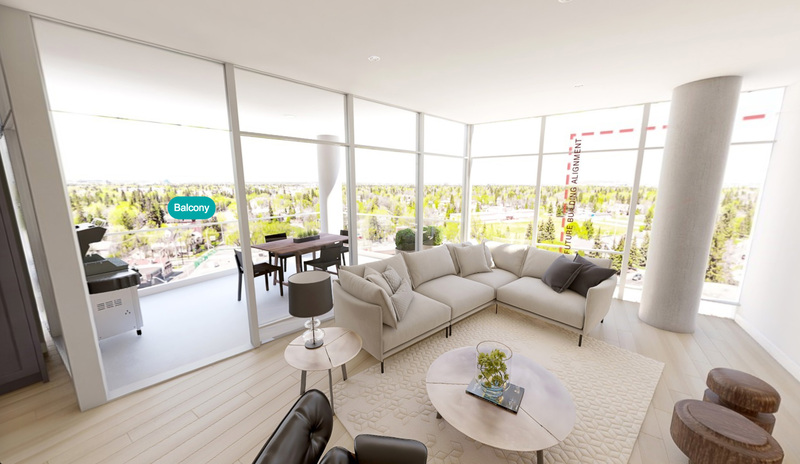 Transported has filled a product gap for us, it’s a flexible way to offer the option of a “360 tour” so that their clients are able to take themselves on their own walkthrough of the house, condo or neighborhood. They can do that either in a showroom, or in the privacy of their own homes, online or in virtual reality. One of the firm’s clients, InHouse, is now building a $70M luxury condominium project in Edmonton, Alberta christened West Block. We had created a video for InHouse showcasing the entire project, but they wanted a way that prospective purchasers could tour a specific individual suite to really get a feel for the size, the view, the finish levels, appliances, and fixtures. So, we created a Transported tour which they were able to use in marketing emails, at their showroom, and on their website. So far the reception has been extremely positive and sales for this particular unit increased two-fold which was their goal. Jorgensen and Nobre were recently recognized for their interactive design work at this years Architectural 3D Awards in Vienna, Austria. More information about The Rapid Eye Movement can be found at therem.ca.